Chocolate is one of the foods that has really been making a renaissance. Every day, more and more people grow interested in all there is to know about the ever expanding world of cacao beans. 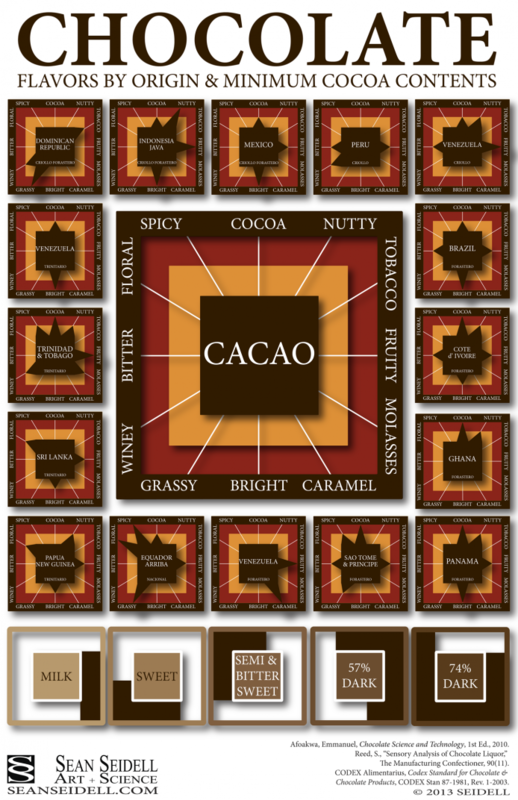 Those aiming to become true chocolate conoisseurs, will love this nifty infographic from the Sean Seidell. It's a complete guide that breaks down every thing you ever wanted to know about chocolate by origin and minimum cacao content. You'll learn that cacao beans come in five main types: criollo, forastero, trinatario, nacional and criollo forastero. Each type has special flavor characteristics determined by where they were grown. Hence, Venezuelan criollo is buttery, fruity and nutty while neighboring Peru produces a less nutty varietal with strong notes of wine. The infographic below will also help you improve your vocabulary for chocolate tasting. You'll find chocolate can be herbal, grassy, floral and have notes of molasses and tobacco. This visual guide is available for purchase in poster form at Seidell's website.